Raisa Ma, an urban planning student at the UCLA Luskin School of Public Affairs, works with the students during a workshop. 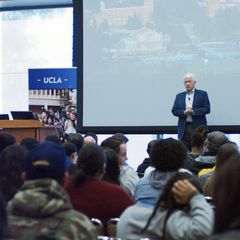 When 105 high school sophomores came together with urban planning students, professors and professionals at the UCLA Luskin School of Public Affairs, everyone in the room stood to benefit. 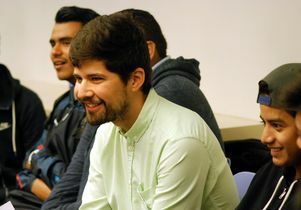 Many young people aren’t familiar with urban planning as a major or career path, said Rodrigo Garcia, who got his master’s degree in urban planning at UCLA Luskin in 2015, a transportation specialist with Alta Planning + Design. As part of the firm’s pro bono work, Garcia collaborates with schools across Los Angeles with the aim of diversifying the field. Alta Planning hosted the March 22 event with the Luskin School’s Planners of Color for Social Equity and Urban Planning Womxn of Color Collective. UCLA Luskin professors Kian Goh, Chris Tilly and Goetz Wolff shared their expertise on the opportunities and challenges that planners face. Sixteen-year-old Paola Flores was unfamiliar with the field before the event but left wanting to know more. She was impressed by a workshop led by Alta Planning’s Kevin Johnson, who got his master’s in urban planning in 2017, who asked the students to chew over a planning issue, then create a meme, gif or Instagram story to communicate their ideas — all in an hour’s time. Flores attends West Adams Preparatory High School in the largely Latino and immigrant community of Pico-Union. Students from UCLA Community School at the Robert F. Kennedy Community Schools in Koreatown were also at the event. “This field is very white and very male. It drives me crazy,” said Maher, who received a B.F.A. in design and certificate in landscape architecture from UCLA. 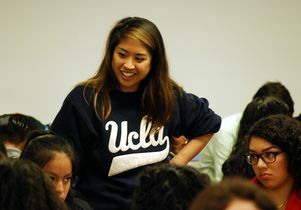 “We need to recruit and retain more planners of color,” agreed Raisa Ma, a graduate studying for her master’s degree in urban planning and one of several UCLA Luskin urban planning students on hand to mentor the high schoolers. They included Marlene Salazar, who moderated a panel that included the three faculty members, undergrad Torres and master’s in urban planning candidates Jacob Woocher and Jesus Peraza. Rodrigo Garcia, center, transportation planner for Alta Planning + Design, mentors visiting students. 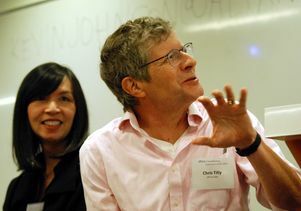 UCLA Luskin Urban Planning faculty members Chris Tilly, center, and Kian Goh field the high school students’ questions.